"Fr. Wyszynski came to us constantly, literally each night, and we hid them [the Jewish family] at our attic. He helped my dad put a ladder and take it back to the garden so that there were no traces of anybody’s presence at the attic." Rome (ZENIT) -- Documents gathered at Yad Vashem in Jerusalem, as well as testimonies of eyewitnesses to Fr. Stefan Wyszynski’s activities, reveal that he was directly involved in helping the Jewish people during the Holocaust. During World War II, Fr. Stefan Wyszynski had to hide from the German occupants. Between October 1941 and June 1942, he was staying in Żułów (District of Krasnystaw) at the center for aid to the blind, which was run by the Franciscan Sisters convent from Laski. At that time he was already involved in his pastoral care for the people staying at the Center, and for inhabitants of the surrounding villages, teaching children in secrecy and supporting the Home Army (AK) soldiers. In his free time, he helped on the farm. Jadwiga Karwowska (née Zalewska), whose parents worked at the aid Center, was a witness to the help Father Wyszyński gave to the Jewish family of three: a father and two of his children, named Gołda (born 1928) and Szmulek (born 1930). Years later Karwowska recalls: "Fr. Wyszynski came to us constantly, literally each night, and we hid them [the Jewish family] at our attic. He helped my dad put a ladder and take it back to the garden so that there were no traces of anybody’s presence at the attic." Franciscan Sisters, priests, and some workers at the aid center in Żułów knew that Gołda and Szmulka were Jewish, yet despite the danger they decided to help them. Esther Grinberg (Morgenstern) reveals other, previously unknown, facts about Fr. Stefan Wyszyński. The interview with her has been kept at Yad Vashem in Jerusalem (ref. O.3/V.T/862). In her testimony she mentions the tragic history of her family. Born in 1918 in Międzyrzec Podlaski, she lost her parents, brother, and sister in the Holocaust. She survived thanks to the help of many people in various places, including some from the capital city, where she arrived during the Warsaw ghetto uprising in 1943. She was concealed by Grażyna Winiarska, among others. In her memoirs she refers twice to the fact that Father Stefan Wyszyński, who at that time moved from Żułów to Laski (near Warsaw), was well known as he encouraged the faithful at his church to help all those who were escaping from the fire of war. As Esther Grinberg mentioned, he did not specify exactly whom to help, mainly for safety reasons, but everyone knew he meant Jews who were at that time massively fleeing the ghetto and seeking refuge on the “Aryan” side. Years later, Father Stefan Wyszyński became bishop of Lublin and Primate of Poland. He has always been close with the people of Laski, who are known for their support for Catholic-Jewish dialogue. 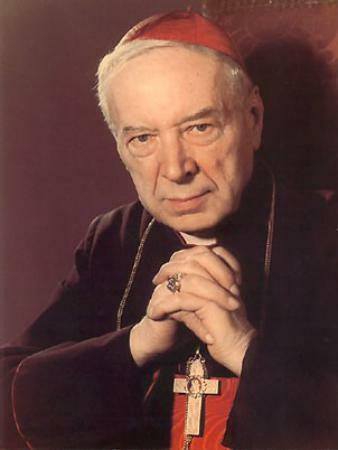 Documents and testimonies found recently at Yad Vashem that mention help given to the Jewish people by a young priest, reveal a previously unknown side of Cardinal Wyszyński.